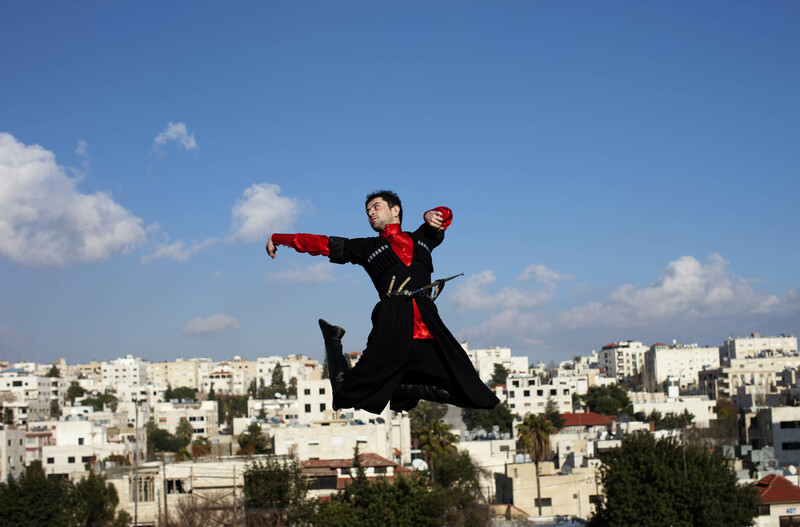 Circassian over Amman © Tanya Habjouqa/ Rawiya. Living in the Middle East can feel as if a hard news cycle dominates your life. For weeks, Middle Easterners were glued to their television sets–a virtual marriage to al Jazeera, riveted by the Egyptian struggle. Because of my new pregnancy I could not go to Egypt–as much as it killed me inside not to be there. It propelled something in our hearts that seemed to have been dead for so long–a specter of pan arabism rising. Mix in the so called Palestine Paper Leaks and again I am running on a hard news tread mill–my work as a journalist overshadowing my photography. Then finally respite–to be a flaneur & find the soul in this place. A stroll with my Palestinian friend Sami in the Western part of Jerusalem–garbed in traditional “falahi” old Arab costume w/ a camera yields surprising results. Palestinian cab drivers shout out their cheers in Arabic and throw a thumbs up sign as they speed by … one Israeli Jew narrows his eyes and gives us the bird. Some just laugh contagiously. Some avert their eyes with a studied indifference. Others laugh and wink, thinking we are mocking the Arab. All, however, react. Just another day of identity politics and flaneurism in the Middle East. I am including for good cheer the pic of a Circassian in Jordan, in traditional costume and dance mode flying over an urban Amman landscape… Rawiya is getting excited by the upcoming event–and we cannot wait to meet you all and lose self in new photography. Aside from the photography exhibits…I think Rawiya is most excited to see each other in the same place–far away from the tugs of hard news.